Sen. Susan Collins speaks at the Maine GOP Convention in Augusta Saturday afternoon, May 5, 2012. AUGUSTA, Maine — U.S. Sen. Susan Collins paid tribute Saturday to her soon-to-be departing Senate colleague Olympia Snowe during remarks at the Maine Republican Party Convention. 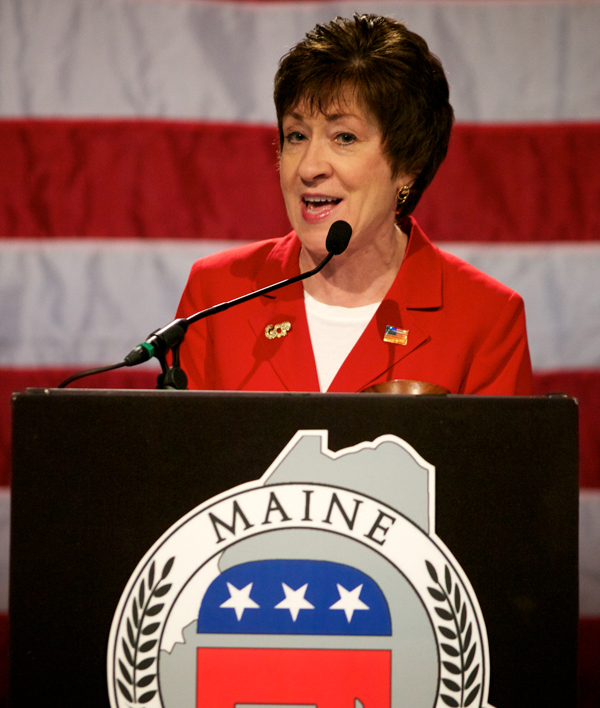 Collins then shifted quickly to praising Maine Republicans for their takeover of the House and Senate in 2010 and for reforming the state over the last two years. “Maine is being guided by our Republican values: a commitment to good jobs in the private sector, a belief in the value of hard work and education and a dedication to fiscal responsibility and less government,” she said. The senator listed several accomplishments of Gov. Paul LePage and the Republican-controlled Legislature: tax cuts, red tape reduction and increased accountability. She stressed that now is not the time to rest, though, and urged Republicans to keep working hard ahead of the 2012 elections. “I stand with each and every one of you as a committed supporter of our outstanding Republican candidates at every level of government, and I will do what it takes to make sure our winning streak continues,” she said. Collins transitioned from state issues and politics to national topics and her target was President Barack Obama. “The president has utterly failed to lead: he rejected his own debt commission, he opposed a balanced budget amendment, and his own budget did not garner a single vote in the Senate,” she said. She also criticized what she called overregulation being pushed by the Obama administration. Collins specifically referenced a recent plan by the U.S. Department of Agriculture to cut down on potatoes being served in schools. Collins jabbed Obama and the Democrats on health care as well. Her 20-minute speech was well-received by the estimated 3,000 attendees of the Maine Republican Party convention.